The April WER report looks at the slow decline that has begun in global oil inventory as OPEC/Russia production cuts over the past quarter reduce crude supply. But, as discussed in the report, re-balancing of supply and demand is hitting headwinds. As OPEC/Russia output has fallen, near term oil demand growth appears to have tapered off and US shale producers have been ramping up crude output -- adding to uncertainty about future oil prices. In the report we describe the most recent FSRU order and discuss a new barrier placed in the path of Petrobras' recovery -- an injunction that ties up $1.25 billion cash from an already completed transaction. We also profile the long term growth of floating production systems and estimate the number of employed and employable production units likely to be in inventory at end 2017 and 2019. 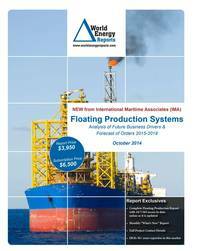 In the data section of the report are details for 202 floater projects in the planning stage, 48 production or storage floaters now on order, 292 floating production units currently in service and 29 production floaters available for redeployment contracts. Charts in the report update the location where floating production and storage systems are being planned, operating, being built and to be installed. Accompanying excel spreadsheets provide the report data in sortable format. Information is current as of 21 April.